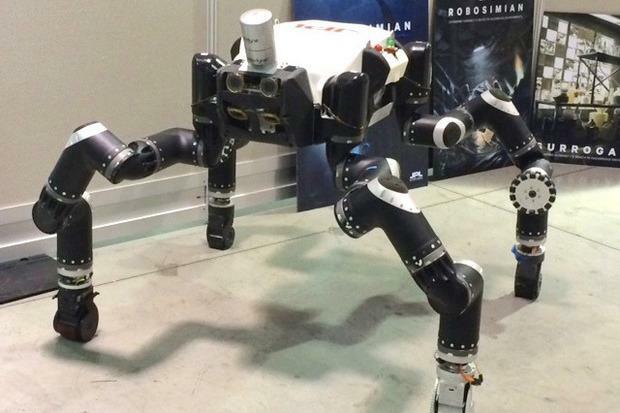 NASA hopes its four-legged robot can one day build parts for the International Space Station and satellites in space. NASA has big plans for the robot its JPL team use to compete in the DARPA Robotics Challenge finals last weekend. The space agency hopes its four-legged robot, which came in fifth place in the DARPA finals, can one day build parts for the International Space Station and satellites in space. The weekend challenge involved two dozen teams competing to see who had built the best robot to aid in disaster response. Now that the JPL, or Jet Propulsion Lab's robot, dubbed Robosimian, has finished competing, its second job will begin. "We actually already have a program with DARPA. Rather than looking at disaster areas, we're looking at assembly work -- in this case, assembly in space," said Brett Kennedy, principle investigator for JPL's team in the robotics challenge. "The dexterity and mobility capabilities that come along with Robosimian could be adapted for zero-g (gravity) environments." Robosimian is a four-legged robot that can stand upright on two legs and use its other two limbs as arms with hands capable of grasping a lever, holding a tool or turning a valve. That design might serve well in orbit, on the moon or even on Mars to build satellites, fuel depots or shelters to house astronauts. "Assembly in space ... it would all be the same robotics problem," Kennedy told Computerworld. "The most immediate research we're going to be doing... would be more along the lines of building very large telescopes or fuel depots for satellites. Currently, the largest telescopes we can build are limited by the size of the rocket that launches them." The bigger the satellite, the bigger the rocket needed to launch it. Larger rockets cost more, making it too expensive to launch large satellites. The same robotics technology also could be used to build fuel depots in orbit. Then robots could be used to refuel satellites, keeping them going far longer. It also would be more efficient and less expensive to refuel satellites than to build and launch new ones. If scientists could figure out a way to launch robots, the parts and possibly 3-D printers into space, then have the robots do the assembly work in orbit or, one day, in deep space, it would be far less expensive to do. By avoiding the structural stresses and high costs of major launches, future satellites would not only be cheaper, but would be bigger and higher functioning. Late last year, Tethers Unlimited Inc., a Bothell, Wash.-based aerospace and defense research company, announced that it is working on six- or eight-legged robotic spiders to build satellites or even spacecraft in space. Researchers hope the project, called SpiderFab, could change the way spacecraft are built and deployed. NASA's Robosimian is probably a few years away from being tested in space, according to Kennedy. "If we can point to something we do on Earth that we could do on another planet, that's a very powerful thing to show people," he added. "We can have a different idea of what missions might be." Robosimian will need to be redesigned for the rigors of space but should still look similar to the way it looked during the DARPA challenge. DARPA's goal is to advance autonomous technology and robotics to the point where robots could be sent into damaged buildings after a disaster to turn off systems, inspect damage and look for victims. In the finals last weekend, the teams were tasked with sending their robots into a simulated disaster scene, taking on eight different tasks, including driving a car, climbing stairs, using a drill to cut a hole in a wall and turning a valve. South Korea's Team Kaist won the challenge, winning the $2 million top prize.